Try this quick and easy chicken dinner recipe for two during the week when you’re too busy for a complicated meal but want to stay in for dinner. This recipe combines honey, sweet raisins, curry powder and chunky salsa for a little bit of sugar and a little bit of spice! This chicken dinner is sure to please even the most discriminating palates! Directions: In 12-inch nonstick skillet, heat oil over medium heat. Stir in curry powder. Cook over medium heat 1 minute, stirring constantly. Stir in remaining ingredients except chicken. Add chicken; turn to coat. Cover; cook over medium-high heat 5 to 6 minutes, turning chicken occasionally, until sauce is bubbly and chicken is thoroughly heated. Cooking the curry powder first gives an authentic taste, but if you’re short on time, just skip that step. 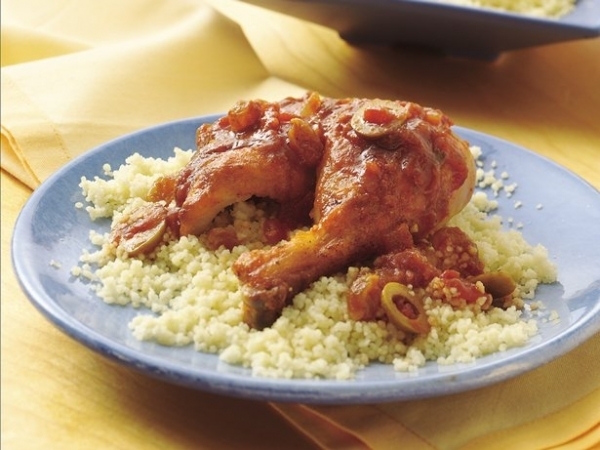 Here’s another tasty idea on the list of dinner recipes for two. 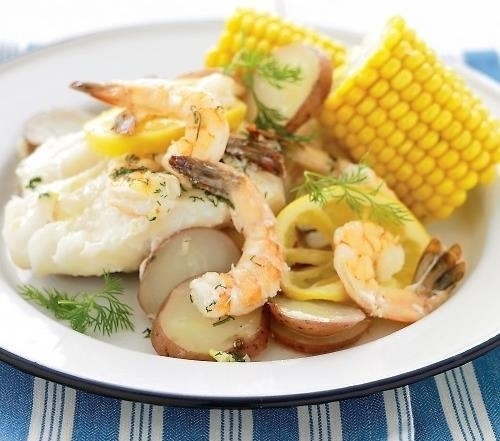 This seafood bake combines scallops, shrimp and halibut fillets-my mouth is watering already! Feel free to use different seafood if you can’t find any of the three main ingredients, it’ll tastes just as good! This recipe is quick, easy and delicious and would make a great date night dinner or relaxing weekend meal! Directions: Preheat oven to 450 degrees F (230 degrees C). Arrange the halibut, scallops, and shrimp in an oven-safe, glass baking dish. Drizzle with wine, butter, and lemon juice. Sprinkle with the seasoning and garlic. Season to taste with salt and pepper. Bake in preheated oven until the halibut has turned white, and is flaky, 10 to 12 minutes. Sprinkle with parsley just before serving. This quick and easy dinner is ideal for those days when you’ve come home late from work and still want to make a hot meal for your man. This recipe is not only yummy but it’s very budge-friendly at that; the total cost for this meal is $1.50 per person! No one will ever know how easy and cheap your fabulous dinner was! Directions: Heat oil in a large skillet over medium-high heat until hot. Add chicken and cook, stirring frequently, until no longer pink. Add vegetables and lid. Cook until vegetables are cooked through, about 5 minutes. In the meantime, cook the noodles (without the flavoring packet) according to package directions. Drain. Add soy sauce, garlic, ginger and seasoning packet to water. Mix well. 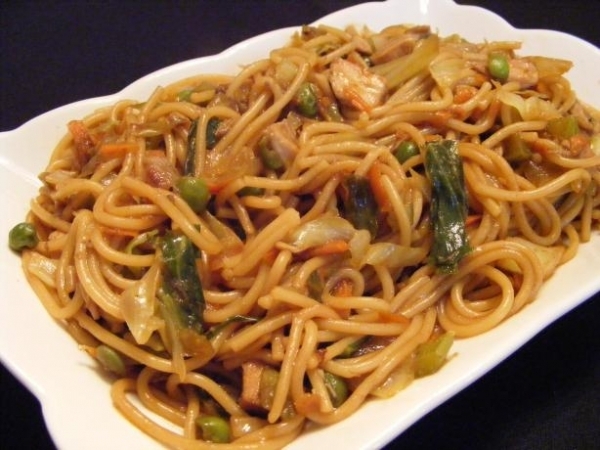 Pour over chicken and vegetables, add noodles and toss to mix. This quick and easy dinner is sure to please any meat lover! I don’t think any man can say no to ribs! This delicious dinner tastes even better when it’s marinated overnight, so you can prep this meal the night before and you’re set! Easy prep and easy cooking-just throw it in the oven and forget about it! You can’t ask for an easier recipe! Directions: Preheat oven to 375 degrees F. Place each rack of ribs on a piece of aluminum foil large enough to completely wrap the ribs (see Note). 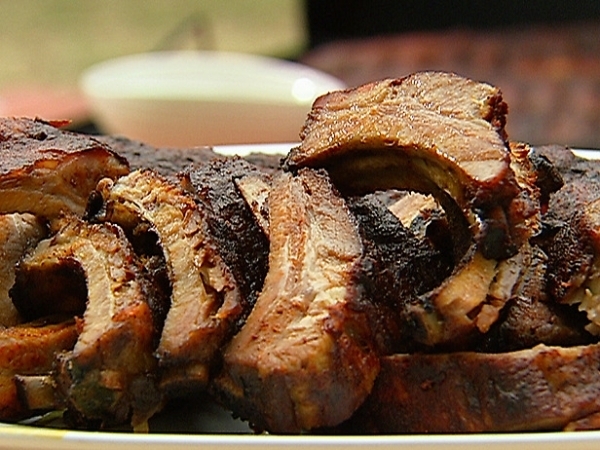 Brush ribs with 1/2 cup barbecue sauce, covering completely, then wrap tightly in foil. Place on rimmed baking sheets and bake 1 hour, or until fork-tender. Carefully unwrap ribs and remove foil. Return ribs to baking sheets; brush with remaining 1/2 cup barbecue sauce, covering completely. Preheat broiler. Broil 5 minutes per side, or until sauce begins to brown. Cut into individual ribs, and serve. 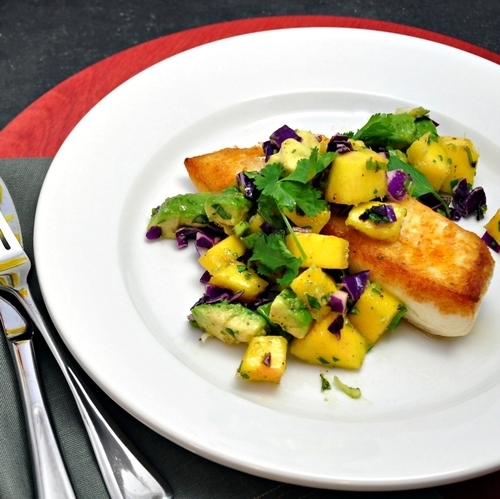 This is one of the healthier dinner recipes for two featuring my favorite protein-packed fish. The savory recipe is sure to be a hit with your boyfriend with its garlic, chili and citrus flavors. 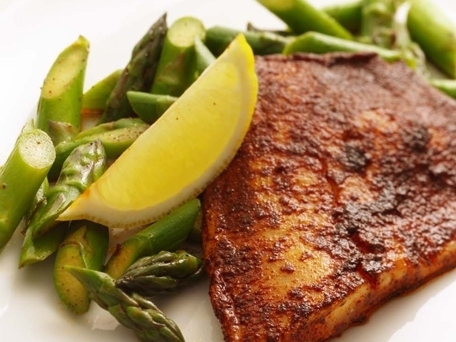 Pairing this scrumptious dish with crunchy asparagus makes for a wonderful blend of textures and flavors, and no one will be able to tell how healthy and low-calorie this meal is! Directions: Bring 1 inch of water to a boil in a large saucepan. Put asparagus in a steamer basket, place in the pan, cover and steam until tender-crisp, about 4 minutes. Transfer to a large plate, spreading out to cool. Here’s a delectable quick and easy dinner for my vegetarian friends! I’m a huge fan of casseroles because you can literally pile the ingredients in a dish, bake and you’re done! 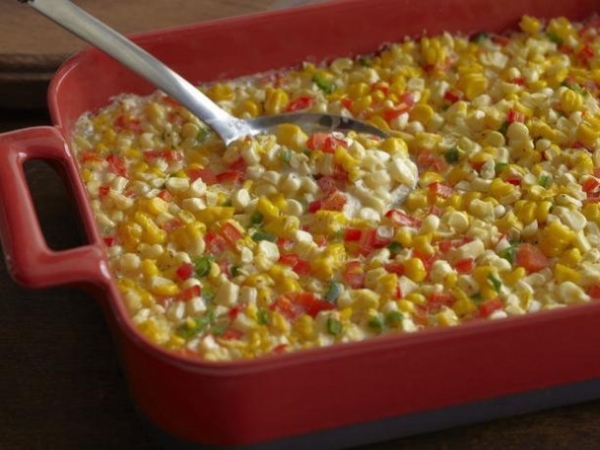 This casserole contains sweet corn and zesty peppers dressed in a mouthwatering cheese sauce. If you like dishes with a Southwestern flair, try this baby out for sure! Directions: Combine peppers, onions, and corn in a 1 1/2 quart microwave-safe casserole. Cover. Microwave on high for 8 minutes, stirring once halfway through cooking. Drain well. Stir in soup, milk, Frank’s RedHot Sauce, 1/3 cup cheese and 2/3 cup French Fried Onions. Sprinkle with remaining cheese and onions. Bake at 350 degrees F for 25 minutes or until hot. This is another dinner recipe for two that is sure to be winner. I mean, what man can resist sirloin?! This delightful dish is pure comfort food, featuring gravy and tender meat. 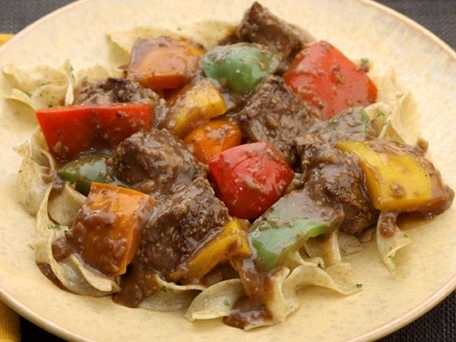 Be sure to serve this beefy dinner on a bed of egg noodles for a rich and delectable meal! With less than 350 calories per serving and packed with protein, this is an ideal meal to serve to refuel on a weeknight after the gym! Directions: Rub steak with fennel seed and 1/4 teaspoon salt, turning to coat on all sides. Heat oil in a large skillet over medium-high heat. Add the steak in a single layer and cook, turning once, until browned on the outside and still pink in the middle, 2 to 4 minutes. Transfer to a plate and cover with foil to keep warm. 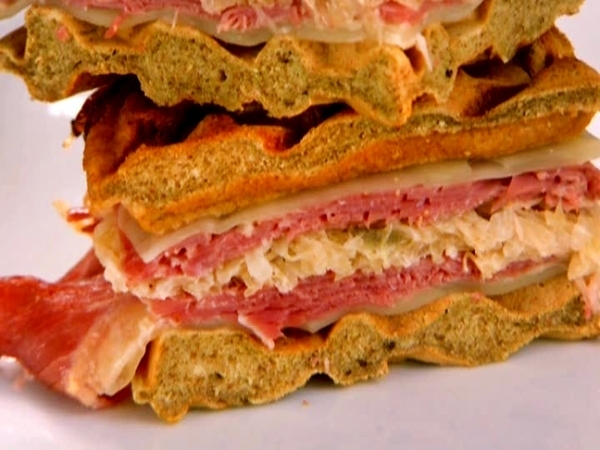 This quick and delicious dinner for two requires a waffle maker so if you don’t have one, I strongly suggest borrowing one just for this recipe! This recipe turns a breakfast staple into a full meal featuring corned beef, Swiss cheese and beer. This recipe is deceptively easy and so unique; your man will think you spent all day in the kitchen preparing this tasty sammie! Directions: Preheat the oven to 250 degrees F and prepare a cookie sheet with a cooling rack on top. In a large bowl, add the rye flour, all-purpose flour, baking soda, baking powder and salt and whisk together to combine. Add the beer, milk, eggs and caraway seeds and whisk again until the wet and dry ingredients are mixed well, about 30 seconds. Spray the waffle iron with nonstick spray. Pour about 1 cup batter into the preheated waffle iron and cook the waffle according to the waffle maker’s instructions. As each waffle is cooked, place it onto the prepared rack in the oven to keep warm. There should be 8 waffles total, or 4 large waffles which can be cut in half. Big Daddy’s Thousand Island: 3/4 cup mayonnaise 1/4 cup ketchup 3 tablespoons sweet pickle relish 1 1/2 tablespoons prepared horseradish 1 teaspoons red wine vinegar Pinch of salt Pinch of coarsely ground black pepper Whisk all the ingredients in a small bowl until well incorporated. Store covered in the refrigerator. Here’s another vegetarian rendition of one of the most popular dinner recipes for two. The burrito stack looks just as good as it tastes! 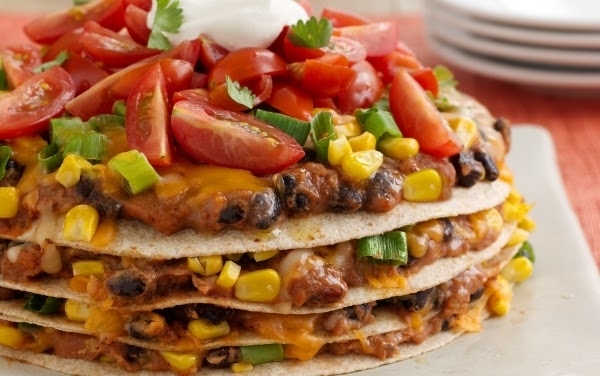 If you’re a Tex-Mex fan, you’re going to fall in love with this delicious recipe! And if you’re a vegetarian and he’s not, don’t worry, he’ll love this meatless dish just as much as any other burrito recipe and he won’t believe it’s less than 500 calories per serving! Directions: Heat oven to 425ºF. Mix first 4 ingredients until well blended; spread onto tortillas. Place 1 tortilla in 13×9-inch dish sprayed with cooking spray; top with 1/4 each of the cheese, corn and onions. Repeat layers 3 times; cover. Bake 25 to 28 min. or until heated through.Top with tomatoes and sour cream. Cut into wedges. If it’s midweek and the two of you aren’t too hungry but still want something tasty to munch on, why not try a taco salad? Taco salads are quick, easy and you really can’t go wrong! Follow this recipe then add some yummy extras like sour cream, guacamole, more veggies, different types of cheese and more! Directions: Saute chicken breast in med.size frypan, I use just a little oil so chicken doesn’t stick. Once it is cooked, remove from pan, and dice up the breasts. Add Salsa and Taco seasoning to pan. Return chicken diced to pan, and let simmer in sauce for 30 minutes. 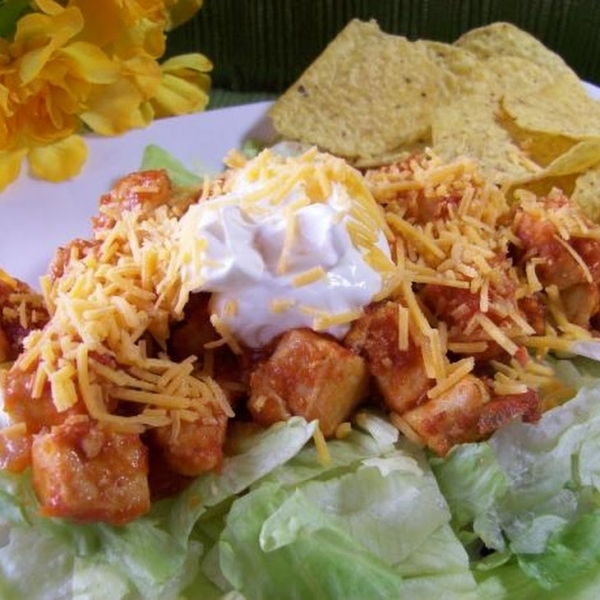 Place bed of lettuce on dinner plate, and add serving of Taco Mix on top of lettuce. Serve chips on the side, they are great to scoop the salad on your fork. Pork is another great protein to have on hand. Did you know that pork loin has the same amount of protein, 22 grams, as most fish fillets? It’s also low in fat and high in vitamin B1. If you haven’t tried making pork in a while, this honey pecan recipe makes a sweet and crunchy entrée that any carnivore will love! Directions: Dredge cutlets in flour, shaking off excess. In a heavy skillet over medium heat, heat 1 tablespoon butter . Add cutlets and sauté until brown on both sides, 5 to 6 minutes. Soften the remaining butter and mix it with the honey and pecans; add to skillet and stir gently. Cover and simmer gently 7 to 8 minutes. 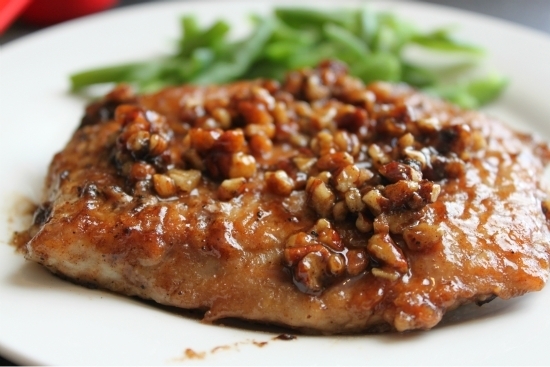 Remove cutlets to a serving platter, and spoon any remaining sauce and pecans over them. I don’t know anyone who wouldn’t love to eat a pizza for dinner, do you? 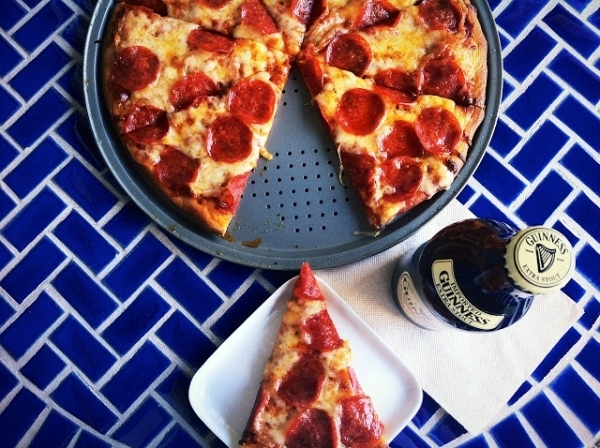 We all deserve to enjoy a treat now and then and this homemade pizza is a great way to end a long day. Plus, you’ll feel much better eating this pizza knowing you made the dough and sauce yourself. Feel free to add your favorite toppings, toss a salad and you’re good to go! Directions: Dough directions: Preheat oven to 425 degrees (400 degrees if using Pyrex pizza pans). Dissolve yeast in warm water. Stir in remaining dough ingredients: beat vigorously, about 20 strokes. Allow dough to rest about 5 minutes while preparing sauce. Sauce: Mix sauce ingredients; set aside. Assembly: Divide dough in half. On lightly greased baking pans, pat/press each half into 12 inch circles. Use floured finger tips when pressing dough into circles. Spread sauce on each circle. Arrange pepperoni on top and sprinkle with mozzarella cheese. Bake for 18-20 minutes or until crust is brown and topping is hot and bubbly. Makes 2 pizzas. To freeze and bake later: double wrap and freeze assembled pizza (without baking) on the pizza pan ~ bake frozen pizza at 400 degrees for 25 minutes. We all need a foolproof recipe for those nights we need to whip up a spur-of-the-moment meal and this delicious chicken recipe is perfect to wow your man! This recipe uses an easy marinade with rosemary and lemon juice that makes this a delightfully flavorful dish! Directions: Place the chicken thighs in a dish. Drizzle over the olive oil, rosemary, lemon slices, salt and pepper. Cover and let marinate in the refrigerator for at least 30 minutes. 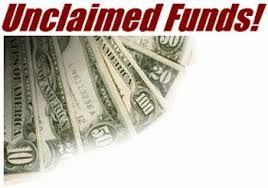 This can be done up to 4 hours in advance. Preheat the oven to 350°F and have a small 8î x 8î baking dish ready. Preheat a cast-iron pan over medium high heat. When hot, drain each chicken breast of excess oil, and place in chicken thigh in the pan, skin side down. 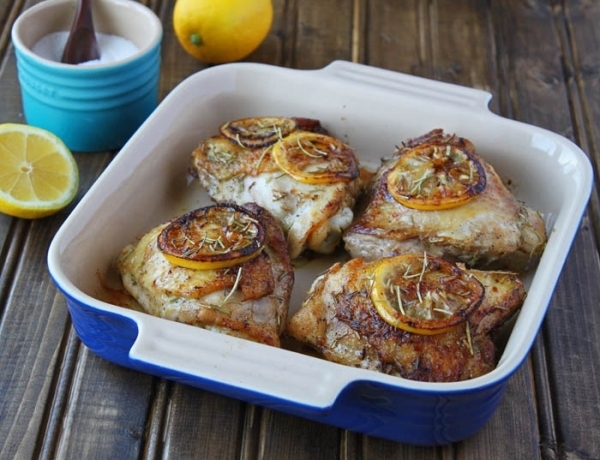 It’s fine to sear the lemon slices with the chicken. Bake for 20 minutes. Test the temperature in the deepest part of the thigh with a food thermometer – it should be 165°F. If it isn’t, return it to the oven for 3 minutes intervals, and re-test. This gorgeous dish can be made with any firm white fish and can also be baked or grilled if searing isn’t your thing. The author of this recipe says the salsa is the star of the dish, so don’t be afraid of adding the colorful and delicious salsa on other dishes, also! If you like your salsa spicy, go ahead and add more jalapeno as this recipe is on the milder side. Heat olive oil in a large, ovenproof skillet over medium-high heat until almost smoking. Add halibut fillets, without crowding, to the hot skillet. Be careful as the oil will cough and sputter. After a few seconds nudge each fillet with a spatula to promote even searing. Continue to sear for about 3 minutes. Gently slide spatula under halibut and peek to see if it has reached your desired level of golden brown. Once it has, transfer skillet to 450 degree oven for 4 to 5 minutes more, until fish is opaque in the center. Remove from oven and flip each fillet. Allow to rest for a moment while the hot oil lightly browns the other side. 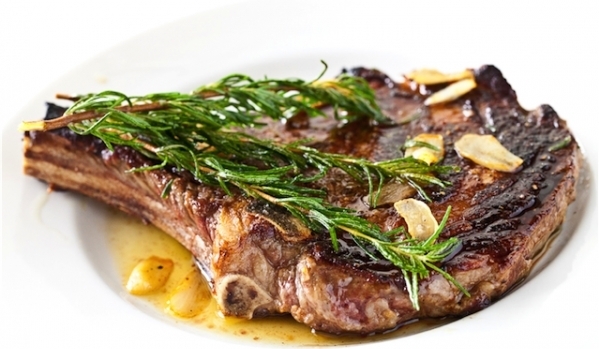 Most men I know are hard-pressed to turn down a juicy steak and this recipe uses fresh garlic to really turn up the flavor of a T-bone steak! What’s even better is that this steak can be prepared on the stove top so you don’t have to worry about having a grill to make a great steak! Directions: Season steaks on both sides with salt and pepper. Using a large skillet or grill pan, brown steaks over medium-high heat for 2 to 3 minutes per side, in batches, if necessary. Remove pan from heat for 1 minute; reduce heat to low. Add butter, garlic, and parsley. Cook steaks 1 to 2 more minutes per side, or until desired doneness. Serve immediately. You’re going to be your boyfriend’s favorite cook with these simple yet tasty dinner recipes for two! There’s nothing worse than coming home from a long day at work, then spending hours in the kitchen to make a decent dinner. Keep these recipes handy anytime you have guests over for a quick meal, everyone will think you’re a genius in the kitchen! What are some of your favorite quick, delicious meals?